I am pleased, through skype connections, to be working with coaches and administrators at ISG, a unique non-profit district of 7 schools in Saudi Arabia. ISG is one of the few international schools that operates as a district with 5 American curriculum schools and 2 British curriculum schools, offering IB, AP, IGSCE and A-levels. Tara Waudby, the Assistant Superintendent for Learning is leading the coaching initiative. She stated, “Despite our different programs, we recognize that good teaching and learning transcends any system.” More about Tara here. Tara is working with 8 digital learning coaches, 2 literacy coaches, 2 instructional coaches and one math coach. She and the coaches recognize themselves as learners and are working to build a coaching model that best supports student learning at ISG. I interviewed Tara for insights about the program’s design. I believe you’ll find some reinforcement for your coaching initiatives and some thoughts to ponder as you consider her words. Steve: Tara, I was impressed when I reviewed your description of coaching and read the phrase “First and foremost, coaches are change agents.” What is the thinking behind that statement? What does it require in the skills set coaches need? Tara: The first article we read together as a group of coaches was Coaches as System Leaders by Jim Knight and Michael Fullan, which focuses on coaches as change agents within a system who partner with school and district leadership. Our current model of specialist coaches was envisioned prior to my arrival, and though I recognized the need to develop ourselves in these areas, I also wanted to ensure that the coaches saw themselves as transformers and transitioners. This is why we created the coaching team at the district level that transcends “specialty”. I also want to ensure that we move away from educational silos and start exploring learning as a whole. If we stay in the silos of literacy and tech integration, we lose the exploration of digital literacies (for example). Hence, first and foremost, we are learning coaches focused on student learning and tasked with changing practice. Steve: You use the words innovation and transforming. What are some actions you imagine coaches taking to promote that direction? Steve: What expectations does your coaching program place upon teachers? What are the expectations for administrators? Tara: This is an area of continued exploration. We support an “opt-in” model in that the coaching relationship should be positive and productive. Coaches do not provide “fixes,” but rather provide support for exploration and growth. The Coaching Expectations document is intended for coaches and administrators. It nicely lays out the expectations so that we can reflect together. It is also easy for administrators to be able to see where their coaches are spending time and how they can coach the coaches. At some of our schools, coaches have become integral members of specific teams. At others, we are expanding BYOD, so the coaches will be assisting with this. This is part of our building process as a group given our fairly new model. All teachers are expected to write an iPGP (individual growth plan) and some principals are having coaches assist teams in writing and implementing these. 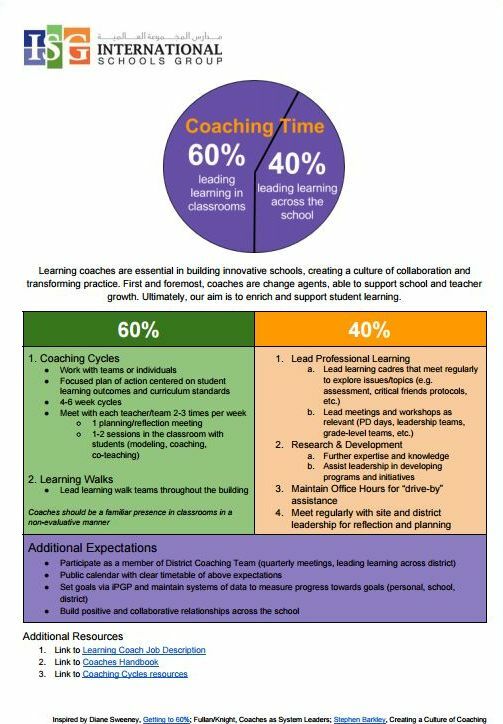 As teachers see how coaches can help in meeting school and district initiatives, they are starting to use them more. Steve: Thanks so much Tara. I am certain many readers have pulled ideas from what you have shared. Are there any additional thoughts you’d like to add? Tara: I strongly believe that learning coaches are going to have a significant impact in transforming education and so I am very committed to this personally and professionally. Our coaches were tasked with building relationships to start, and as they have done this and built trust, they have begun working more closely with teams and teachers. It’s exciting to see the progress in just 9 short months! Great information and resources Steve!